I have been skeptical for a while about what we Christians call worship and how we worship God, but I am now fully convinced that more than 90% of Christians have no clue of the act of worshiping God. In the world of today, we Christians believe worshiping God is when we attend church services or when we lift up our hands in church or when the church choir starts singing or when we fall into trance and begin to speak in tongues (click here read more about lies in churches on Holy Spirit). Unfortunately, none of these is worship. Singing to God is good, which you do not have to be in church to do so, but worshiping is a different ball game entirely. We always refer to David on how he sang and dance in the temple before God, which were most times an atonement for his sins, but today there is no more temple, we are now the temple. Let us break this down further with the book of John 4. In this chapter, Jesus had a conversation with a Samaritan woman, whom had lived with five husbands. The woman came to fetch water from the well as usual to quench her thirst and Jesus offered her a spring of life, which she will never have to come to the well to fetch water again. Jesus went further to tell her that neither would anyone will be required to worship in the temple in Samaria or Jerusalem, as true worshipers will worship God in truth and in Spirit. We go to church every Sunday or three times a week to be refreshed by what we call worshiping God just as the Samaritan woman comes to well to fetch water to quench her thirst, and Jesus offered her a spring of life that will never require her to come to the well to fetch water again. To make it clear, Jesus told her plainly that you do not need a temple to worship God anymore, because the temple is man-made, which God does not dwell (Acts 7: 47-48). Therefore, God dwells in our heart and we are made by him not by man, which is why He dwells in us (we are the temple). Now, it is clear in John 4 that everything done in the temple has nothing to do with worshiping God in spirit and in truth; because if it does Jesus would have told the Samaritan woman she can worship in the temple in Samaria or Jerusalem. The gathering of the brethren should majorly be to edify each other with the scripture and pray if need be (as you can always pray by yourself or your family), just as the apostle did, but today our churches are now motivation centers, business centers, networking centers, and so on. By the way, the gathering of the brethren can be you and your friends or you and your family in your dinning (Matthew 18: 19-20). 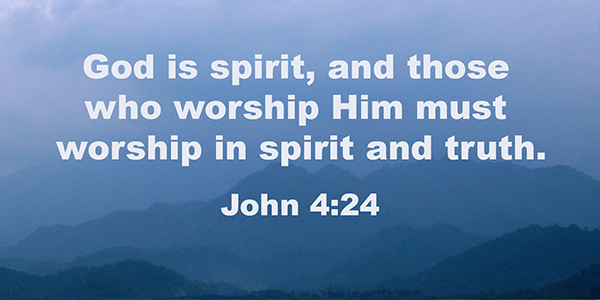 The question is how do you worship God in truth and in spirit? Worshiping God in spirit is simply righteousness, which is living a life with zero sin or a life that is making effort to reduce sin to the minimum if not zero. It is a life that obeys God’s command, which is love your neighbor as yourself (John 13: 34-35). A life of love, joy, peace, forbearance, kindness, goodness, faithfulness, gentleness and self-control (Galatians 5: 22-23; Romans 12:1). God does not delight in your sacrifice and offerings, but He delights in your obedience, which is worship (1 Samuel 15:22). Abraham obeyed and believed in God and it was credited to him as righteousness, he did not go to any church to worship. The apostles majorly focused on living a righteous life for God and helping the needy, which is the true act of worship in the spirit. The apostles sang hymns to minister to each other not to worship God (Ephesians 5:19). When you love your neighbour and help those in need, you are building an eternal treasure for yourself in heaven – that is true worship in spirit (Luke 12: 32-34). For worshiping in truth, this involves you coming to the full understanding of the truth about God and being free in this truth; because it is until you know the truth in Christ before you can be free. Many Christians still operate under the law thinking they are under grace. Understanding the truth about God requires a deep study and understanding of the scriptures, not what they read to you in church. It is a personal journey with Christ through the scriptures not through your pastor. You cannot operate under the law and worship God in truth (Romans 6:14; Galatians 5:4). Therefore, brethren I encourage you to re-examine yourself and pay close attention to the scripture and not your pastor, because when Jesus shall come in His glory he would not ask you how many times you attended church or how you sang in church or how you spoke in tongues or if you paid your tithe and offerings, and He would not judge you as a church, but He would judge you individually and ask how you have loved your neighbours and helped the needy (Matthew 25: 31-46).